Let the kids get their hands dirty, remember you can always wash clothes + sweep the floor later...let those babies have some fun. Grab some cheap festive cookie cutters, some sprinkles, and a couple of icing color choices...blast some Christmas music + just have fun! Who cares if your cookies don't look Pinterest perfect! Another classic suggestion, but don't underestimate the fun of piling up on the floor of the living room together with blankets + popcorn while watching a Christmas classic together. Lots of cities are known for their Christmas lights...do a quick search if you aren't familiar with any near you. Or better yet, just load everyone up in the car with some snacks and comfy clothes and go for a drive! We all get busy this time of year, but I say take advantage of the kids having a break from school, let them stay up late, make a deal about it, make it special, and have a PJs party...which is basically just extra cuddles with Momma. On the theme of taking time to slow down. Grab a basket and have the kids pull out a few books that they'd like to use as bedtime stories over the next couple of weeks. Start dinner 20 or 30 minutes early so you'll have plenty of time to sit down for a little story time. Bonus points for reading a Christmas book! Turn the Christmas music up, bust out with your silliest dance moves, get the kids to giggling...and bonus points if you can get Dad in on the fun! A lot of schools + churches will be putting on shows or plays this time of year. Look on Facebook for free or cheap public events near you. Dinners don't have to be fancy or expensive for them to be fun! Invite a few of your friends over, ask each person to bring one dish, let the kids play, and enjoy some time with a few of your favorite people. This is one of my new favorite traditions! I'm not a great cook, so I opt for the gingerbread house kits that cost around $10 or just graham crackers, cake frosting, + cheap candies. Bonus points if you split up into groups + turn it into a contest. Want to do something a little more traditional? Start an advent tradition or other Biblical based event that'll be fun for the kids. Reminding your kids (and yourself) the true reason for the season could also involve a service project or volunteer work. 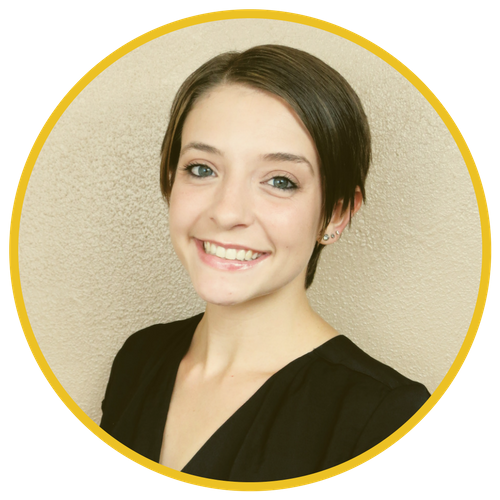 Ask about singing at a nursing home, volunteer at a soup kitchen, start a coat drive, or think up your own service project. Break out a board game, card game, or puzzle. Video games would work too...but I always vote for less technology when it comes to family time...that's when the best memories are made! Do a quick Pinterest search for "easy Christmas crafts", make a run to Dollar Tree or Hobby Lobby with a list in hand, and plan a fun little craft project. Remember that it doesn't have to be perfect or fancy to entertain the kids! Bonus points if you can reuse these craft projects as Christmas gifts for Grandparents or Teachers. On the theme of being crafty...grab some plain brown shipping paper, some paint or markers, and let the kids go crazy decorating! If you want to stick with a color theme then only set out a few color options. Grab a few stickers or cookie cutters to trace from Dollar Tree to pack a little extra punch. One of my favorite memories as a kid was getting to help wrap my sisters' Christmas presents. Not only was it a little special time with my parents, it was really fun getting know what their presents were before they did! ...just make sure your kids are old enough to understand how to keep secrets! Another fun tradition that can fall to the wayside when you're on a strict budget is doing professional photo shoots. No worries though! Make a fun little set in the living room, in front of the Christmas tree, or somewhere in your town. If you aren't able to splurge on new outfits opt for at least color coordinating outfits or even cute PJs. Grab your phone and your favorite editing app, and make the best of it! Take advantage of the timer setting or ask a friend or family member to act as the photographer so Mom can be in a picture for once! Have fun with it and don't over-stress if every kid doesn't look perfect! 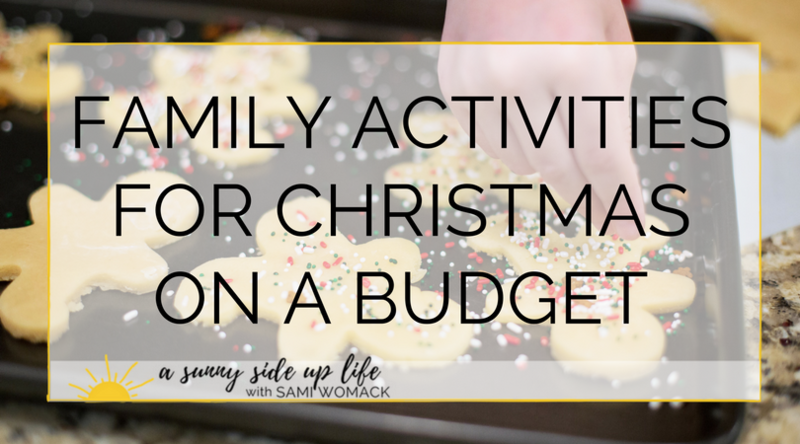 I know there's really an endless list of fun things you could do as a family this season, but I hope that my list inspires you + reminds you that you don't have to spend a lot of money to have fun! ...and when in doubt, just ask your kids what they want to do! Most of the time it'll be the simplest things that mean the most to them!